My sister in law introduced me to these bread sticks. They were ultra soft and were so fun to un-twist and eat, so I asked her for the recipe. Come to find out, I already had the recipe in a cookbook that she gave me many years ago! I followed the instructions exactly. Added in the full amount of flour. That's more like it! Soft, slightly sticky, elastic, nearly cleaning the sides of the bowl. The recipe said to only let it raise 10 minutes, but I gave it 20. You may need to let it rise longer, especially if you live at low altitudes. 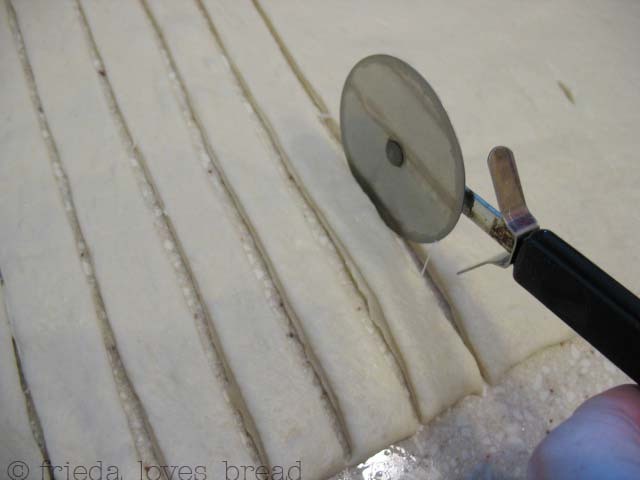 The dough is rolled out into an approximate 20"x12" rectangle, then cut into 1" strips. Each twist is put onto an ungreased baking sheet or Silpat baking mat and sprinkled with toppings of your choice: garlic salt, Parmesan cheese, Salad Supreme or Johnny's Garlic Seasoning. Here's how they look after 20 minutes of rising time. They should feel light and spongy. Hot and fresh....ready to eat! I loved un-twisting them. I do this with cinnamon rolls or pull-apart rolls. 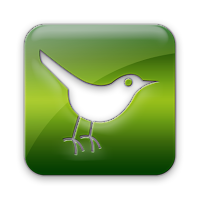 I take my time and enjoy every morsel and crumb. Verdict? They were not as soft and light as my sister in law's. They were more chewy and pizza-crust like, possibly because I used bread flour. They were still great paired with a white chicken chili for dinner that night. 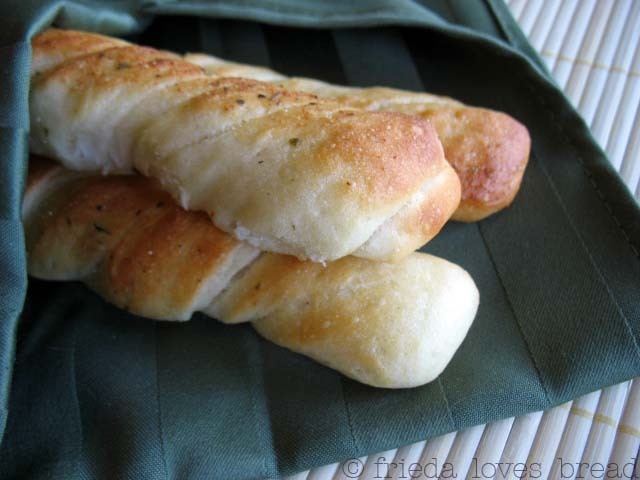 I like using my Dinner Roll recipe for many things, and you can easily use it to make these Buttery Bread Stick Twists. Put 2 c. flour in mixing bowl. Add yeast, gluten and salt. Mix well. **Put UNCRACKED, WHOLE eggs in a drinking glass and fill up with hot tap water; set aside. This will bring the eggs to room temperature. In a microwave safe bowl, combine milk, sugar, butter and melt on 1/2 power (50 or 50%) in microwave for 3 minutes or until butter is almost melted. Stir until butter and sugar is dissolved. Drain water from eggs. Crack eggs and add eggs to milk mixture. Pour into flour mixture and mix well. Allow mixture to sit, or "sponge" for 10 minutes. Touch dough lightly. 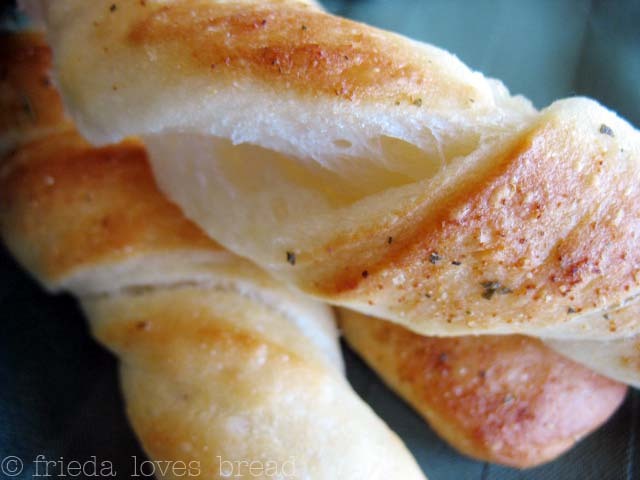 Add more flour if dough sticks to your fingers. 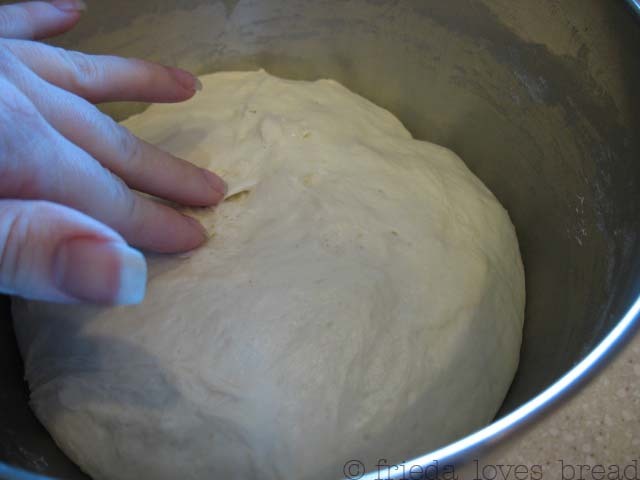 Knead for 3-4 minutes. 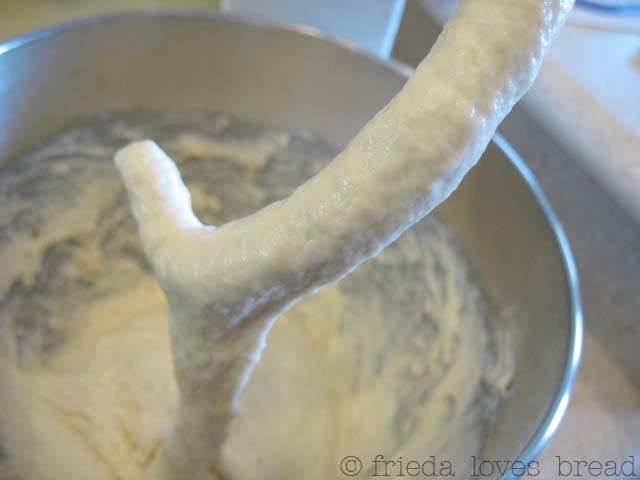 Dough should be soft, smooth, elastic, wet, and not sticky. Scrape down sides of bowl, oil the top, and cover with plastic wrap. Divide dough into 2 piles. Cover with plastic wrap till ready to roll out. Melt the 1/2 cup butter. Roll each ball into a 20"x12" rectangle. Cut into 1" strips. 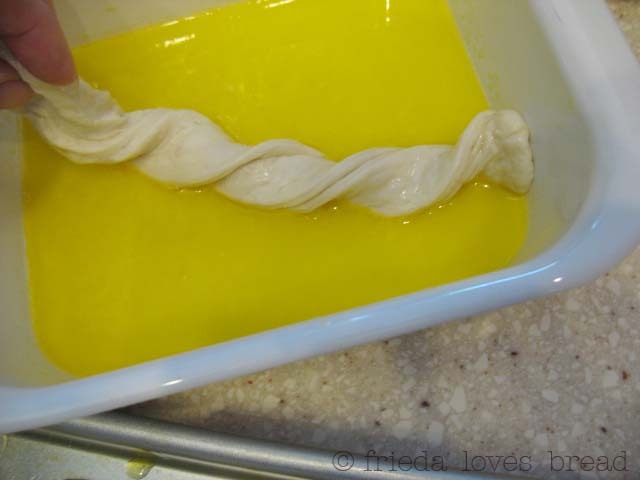 Fold each strip in half, twist, and dip in melted butter. 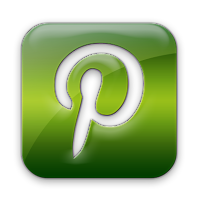 Place butter coated breadstick on ungreased baking sheet or Silpat. Cover lightly with plastic wrap, let rise in warm place till double in size, about 20-30 min. Serve immediately or place on wire cooling rack. I think my favorite part of this post was the dipping in the butter part! These look so good! 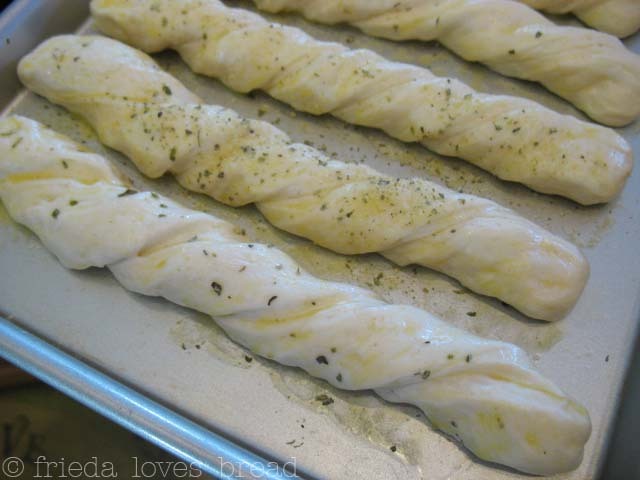 I've been looking for a yummy recipe for breadsticks! looks delicious! 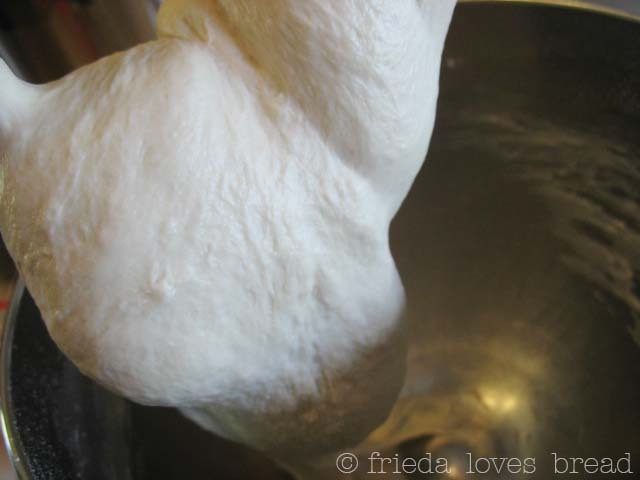 wonderful that you showed a picture of dough when it needs more flour so people can understand! The breadsticks are beautiful! Oh, wow. Those look fantastic! I could go for some right now. =) I bet my girls would like to help make them, too. Yay for dipping in butter! Yes, Di, your girls would love to dip these... who doesn't love butter?